I watched the latest live stream and didn't get my skin after claiming it. I have a screenshot! 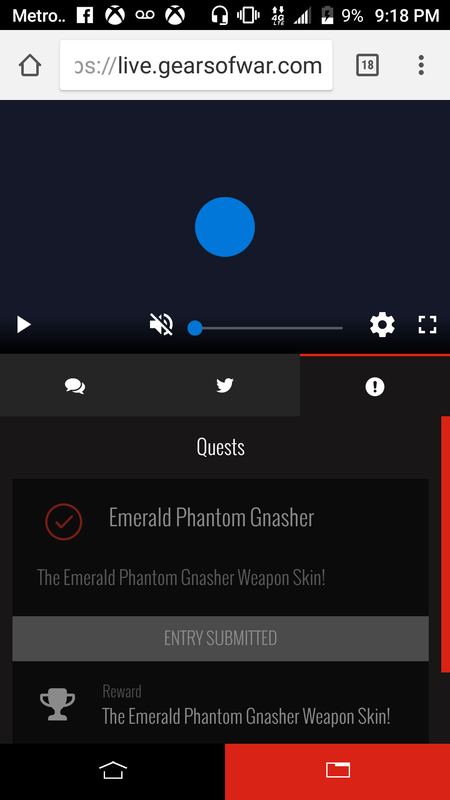 I don’t have my emerald phantom gnashed this live stream. I gave proof u submitted my reward. Missing Gears Weapon Skins from Streams on live.gearsofwar.com? Post here! Why didn’t you post the screenshot. I had my sister claim mines while I was in the shower and she said something about the reward being handed out next week. Not sure if she was lying or not though lol. I managed to claim mine within the first 2 minutes it was available, after that against all odds and to the surprise of everyone : the system collapsed, yep they did it again. Mod closed the reward while trying to fix the mess but since they made the reward available 2 minutes before the end of the show all hell broke lose. They couldn’t fix it and although I can’t confirm the solution given, it’s either manual reward to everyone logged in during the stream or most likely it will be available next week. One would think they learned from their mistakes but nope, this happened again and I’m sure it will happen in the future. I suggested that the “stream” (TC / dev or All access) be released later. Live Stream becomes replays, and quest for skins stay active. Especially for those like me, who fall asleep before or have, like you, a “bug” claim. In addition, if the quest requires a follow-up of 30 minutes, what does it change if we go back? less advertising or audience need !? Because some people can steal that screenshot and photoshop it and submit a fake claim. They said the emerald phantom gnasher will be distributed automatically and going to take up to 2 weeks to recieve it. All you can do is wait. then if you are going to mention something about a screenshot but not show it, then whats the point of mentioning it. In case if the esports team needs to know if they have a screenshot. But I dont think screenshots are no longer needed as long as they have the GT they can see who claimed or not. From cheaters you’ve been promised a reward if you participate in cheating stream viewers numbers then you complain for being cheated. I claimed it on one of my accounts just fine, but then for my second account, it said that I would get it it within 2 weeks. Perhaps you will also get it within 2 weeks? I had issues claiming last night… but after awhile a claimed notice appeared on my screen (this is before the reset they did). I already previously had the skin, so I checked my inventory online and I now had 2 skins appearing. This morning, I went to play my first win of the day and the skin has been removed from my inventory leaving me back with only my original skin that I already had. If you still do not have the skin from last nights All Access, please head over to the Missing Gears Esports Weapon Skins? Post here! Make sure to read full details of the original post before making a claim of the missing weapon skin. Thank you, and will be closing this now.